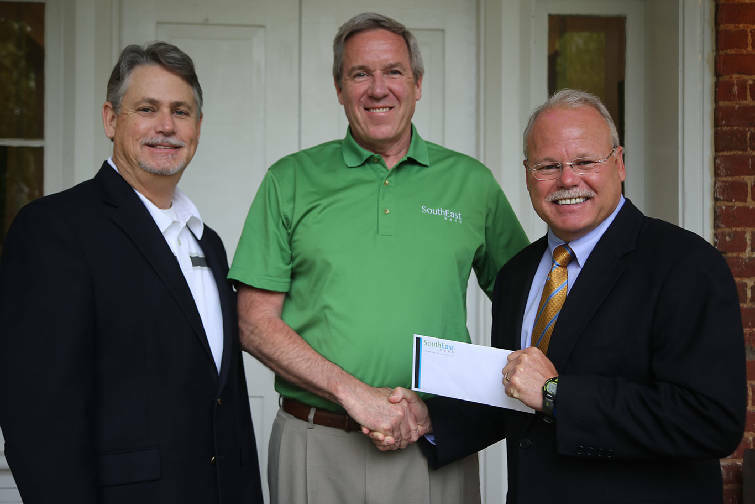 Tom Hughes, SouthEast Bank city president; Monty Montgomery, SouthEast Bank president and chief operations officer from left, make a donation to Harley Knowles, president of Tennessee Wesleyan College, right. Regional businesses and alumni of Tennessee Wesleyan College in Athens, Tenn., have made donations to the college's Proud Heritage, Strong Future campaign. The $16 million campaign has four funding priorities: annual fund support, student scholarships, academic support and facility enhancements, including the construction of a new 30,000-square-foot campus center. SouthEast Bank has pledged to fund four $7,000 scholarships per year for TWC students. The $28,000 per year commitment is in addition to $183,000 the bank has already invested in student scholarships at the college. The SouthEast Bank Scholars program is designed to identify and reward deserving students throughout the region. "SouthEast Bank is committed to supporting education," SouthEast Bank City President Tom Hughes said, "and we understand the value of encouraging talented young adults in Tennessee to remain in our state to become our future leaders." Students chosen to receive these awards must have a high school grade-point average of at least 3.25 and plan to major in accounting or finance. The award is renewable each year, as long as the student recipient remains in good academic standing. The George R. Johnson Family Foundation/Hardee's has donated $500,000 to Tennessee Wesleyan College's capital campaign. The donation will go toward the new $7 million Colloms Campus Center on the Athens campus. George R. Johnson grew up in Calhoun, Tenn., and attended Tennessee Wesleyan College from 1949-1950, before joining the Navy during the Korean War. Upon his return from Korea, Johnson attended the University of Tennessee at Knoxville on the G.I. Bill. Upon his graduation, he became an entrepreneur who built Hardee's restaurants throughout East Tennessee and North Georgia. The first area Hardee's restaurant was built in Athens, Tenn., in 1966, and the second was built in Cleveland in 1967. Johnson also started the family foundation to benefit the communities in which his Hardee's restaurants are located. The new campus center will include student life offices, a cafe, gaming area, student success center and several meeting spaces. The large conference center on the second floor will be named the Johnson Ballroom in honor of Johnson. TWC alumni Hugh and Kay Walker have made a donation to the campaign's scholarship program, which will fund the Hugh and Kay Walker Endowed Scholarship to benefit a female athlete at TWC. State Farm Insurance Agency, Hugh's employer, matched the Walkers' gift. The scholarship for a female athlete recognizes Walker's coaching career. He coached golf, women's basketball and baseball at Calhoun High School, and women's basketball and softball at Cleveland State Community College. Kay Walker taught and was a librarian for 35 years, spending one year in the library at TWC.